I am so excited about the Michelangelo & Sebastiano exhibition opening at the National Gallery in March, especially as they will be borrowing this beautiful work by the lesser known of the two artists, Sebastiano del Piombo. Like Michelangelo‘s sculpture of the same name from 1498-99, this Pietà (1516-17) is minimal in composition, but powerful in its impact. Mary is monumental in size; her clothes form a solid shape around her creating a pyramid, with the body of Christ at the base. This clever use of geometry leads our eye from her face, down the lines to that of Christ’s, along his crucified emaciated body, and back to the apex again. Mary’s eyes are cast towards heaven, but rather than looking distraught in mourning she has a look that expresses pathos, composure and knowing. Throughout Western art depictions of Madonna and Child hint at Jesus’s fate, though the bible does not explicitly say that Mary knew this from the start. 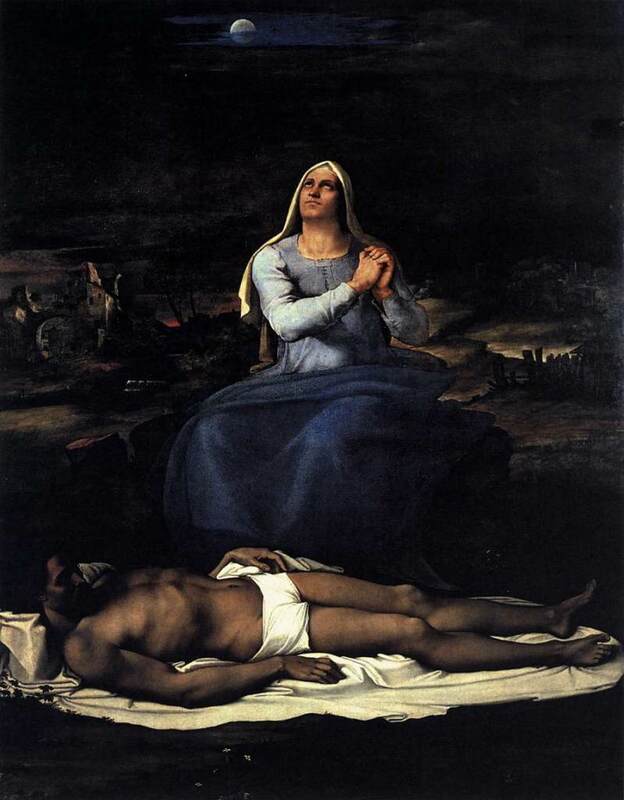 This painting suggests that she had come to terms with her son’s death, as it is not a typical emotionally wrought lamentation scene. Del Piombo’s Madonna is serene and strong, mysterious and almost otherworldly. Her mouth is set and her eyes wide, her hands clasped in prayer. It is worth noting that this Mary is not beautiful or idealised, as was the norm in Renaissance art. Rather she is masculine and bulky, showing yet another aspect of Michelanglo’s influence over the painter. This was quite a radical painting in its time, and even now retains some air of mystery and peculiarity. It is unlike any scene of the same subject that went before, and I am sure it is the only one of its kind to have been set at night. I love the deep, cool colours, they create a heavy atmosphere – unusual for an artist who was trained by fellow Venetians Giovanni Bellini and Giorgione. The landscape in the background is apocalyptic with the moody sky and desolate ruins. And this, I think, is what makes the painting so emotive; the emotion is told not through the face of a grief stricken face, but the synthesis of the whole painting.